Central Organisation for Railway Electrification (CORE) was set up in 1979 under Ministry of Railways with the prime objective of electrification of railway tracks over the Indian Railways. It was almost 40 years since its inception; the organization is marching ahead in the field of electrification by contributing 43.47% of total electrified sections of Indian Railway. A lot of emphasis is given to Railway Electrification in recent years with a view to reduce the Nation’s dependence on imported petroleum based energy and to enhance the country’s energy security, with a vision of providing eco-friendly, faster and energy efficient mode of transportation. 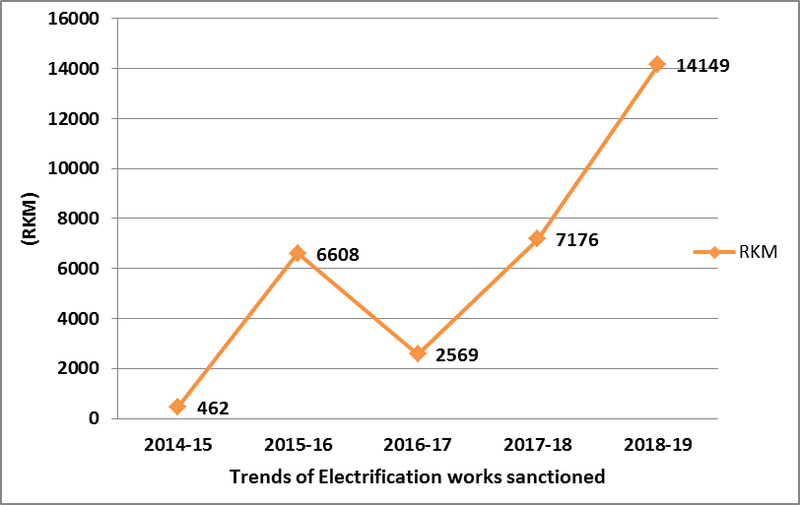 During the last five years, total 204 electrification projects consisting of 30964 RKM have been sanctioned by Government of India and keeping in mind the huge cost savings and considerable reduction in carbon foot print, Indian Railway has identified electrification of all BG routes as a mission area. Total 38,000 RKM has been identified for electrification of BG network by 2021. 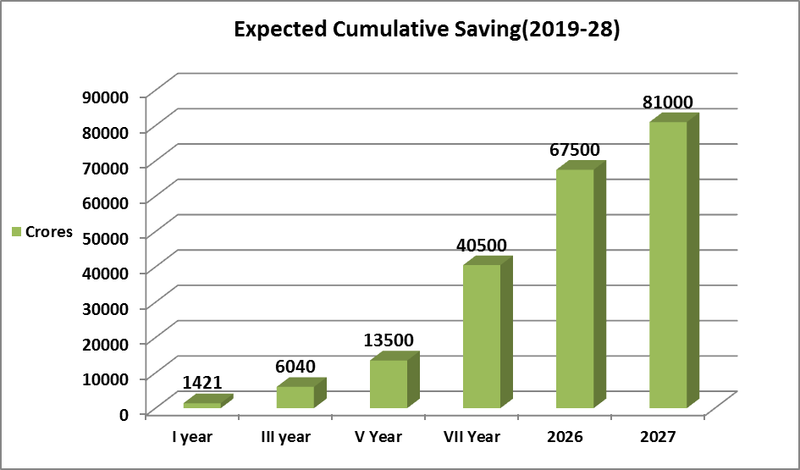 As per study total green house gases emission from electric traction will become less than the diesel traction from 2020-21 onwards. · Reduced dependence on imported petroleum based fuels. · It provides energy efficient friendly mode of transports besides improving the system throughput. · Faster and environment friendly. · Reduced line hauls cost. · Increased sectional capacity by about 18% due to higher average speeds. · Reduced capital, operating and maintenance costs. · Offers regenerative braking resulting in saving of energy by around 20% in locomotives and around 30% in electric multiple units. So far we have electrified 29288 RKMs which accounts for about 43.47% of total Route Kilometers on Indian Railways. Presently about 54% of passenger traffic and about 65% of freight traffic is being carried on electric traction. Status shows that the fuel expenditure for electric traction is just 36% of total fuel expenditure of Indian Railway, with electric traction accounting for Rs.9,700 crore of fuel expenditure against the total fuel expenditure of IR at Rs.26,800 crore. This is a major indication of the economic benefits associated with electric traction. 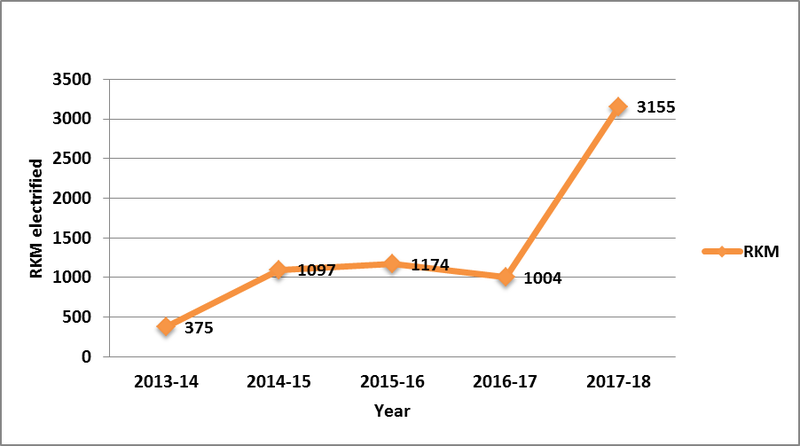 CORE is also showing its commitment for mission electrification by electrifying 3155 RKM during the current year 2017-18. This is highest ever achievement in the history of this organization which is 3.14 times the electrification done in last year. During the year 24 TSSs, 52 SPs and 101 SSPs have been commissioned which is highest ever achievement in a financial year. CORE has commissioned this section with high rise OHE having contact wire height of 7.57 m which is suitable for running of double stack container trains. 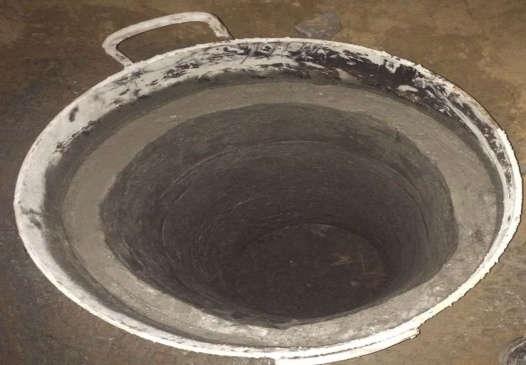 This is the first section commissioned over Indian Railways with contact wire height of 7.57 mtr. Electrification of this section will enable connecting of two electrified sections, faster acceleration of trains and pave the way for operation of Mainline Electric Multiple Unit trains (MEMU) instead of diesel ones between CBE to TPJ. Thus loco change at TPJ/ED can be avoided. The commissioning of this section has opened important link on electric traction between Patna-Barauni routes to Gaya-Dhanbad route. Bakhtiyarpur is a missing link between two electrified corridors of Mughalsarai – Patna – Bakhtiyarpur –Sitarampur – Howrah (Delhi-Howrah main line) and Mughalsarai-Gaya-Dhanbad-Sitarampur-Howrah (Grand Chord). •With the electrification of entire section, there will be seamless flow of electric trains in this section as traction changes/detentions at Manpur and Bakhtiyarpur ends would be eliminated. 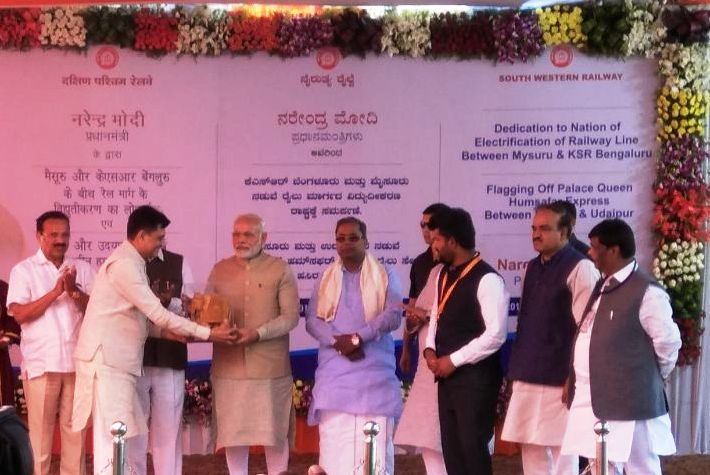 Hon’ble Prime Minister Narendra Modi has inaugurated the electrification of Bengaluru-Mysuru railway line, which is set to reduce the travel time between the two cities. With the commissioning of this section on electric traction the rail travel between Bangalore and Mysuru will see a big transformation. 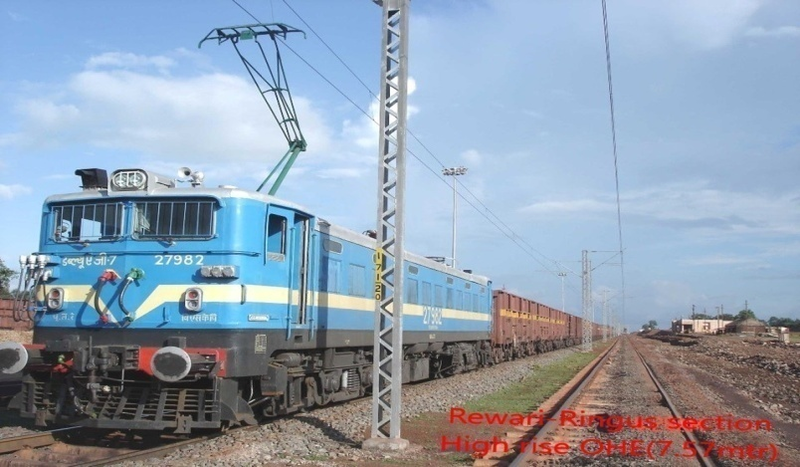 Nallapadu-Guntakal section of South Central Railway covering 420 RKM has been opened on electric traction facilitating haulage of electric trains between Guntur-Guntakal and created another electric route between Guntur to Bengaluru via this section. With the commissioning of electric traction in this section shortest links has been opened between Eastern & Southern regions via Bilaspur-Gondia-Ballarshah-Hyderabad. The commissioning of this section has paved the way for running the electric train between West Central Railway (Jabalpur) to Southern and Central Railway via Itarsi avoiding change of traction at Itari. The section creates another important link between Howrah to Jammu Tawi via Bardhman-Asansol-Malda-Katihar-Gorakhpur facilitating haulage of electric trains up to Vaishnao Devi Mandir Katra station. This is important single line section connecting major links between Delhi-Northern zones to Howrah/Puri via Allahabad-Chopan-Garwa Road. After completion of the project, the Rail operations on the entire route will be possible with Electric Traction. With the commissioning of electric traction in this section major links will be opened between Bilaspur-Rourkela to Titlagarh-Visakhapatnam. The electrification of this section will facilitate seamless train operation between Patna-Mumbai/Chennai/Goa & ADI on electric traction. With the commissioning of electric traction in this section, the trains up to Delhi from Gandhinagar and important route between Delhi-Alwar-Jaipur-Ahmedabad-Mumbai will be opened on electric traction. After commissioning of these entire section major ports Pipuvav and Mundra will be connected to important commercial cities viz. Mumbai, Delhi & Ahmedabad on electric traction. 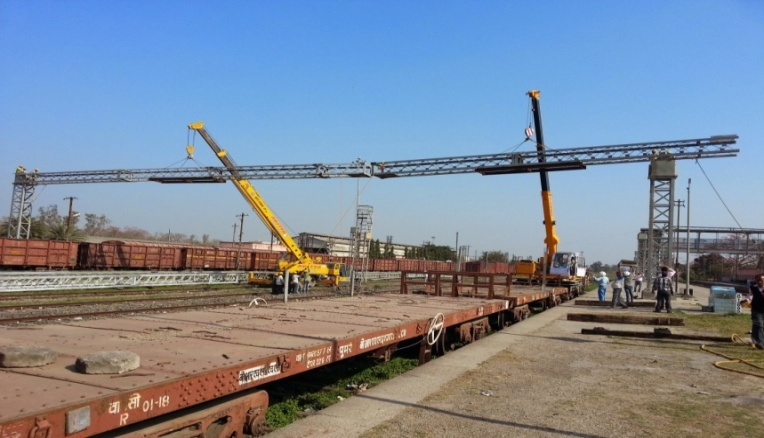 This will facilitate heavier freight trains operations at high speed. After electrification of this section Manmad will be connected to important cities of southern States eg. Secundrabad, Guntakal, Chennai, Bangalore on electric route. Electrification of railway routes from Katihar to Raninagar Jalpaiguri is in advance stage and expansion of electrification upto Guwahati will ensure seamless movement from this region to other parts of the country. Badarpur-Silchar (incl. Arunachal-Jiribam, Katakhal-Bhairabi) & Badarpur-Karimganj-Agartala (incl.Agartala-Akhaura & Karimganj)-Mahishashan (590 RKM). The project will ensure connecting entire North Eastern regions to the national capital on electric traction which will eliminate the need for change in traction facilitating heavier freight trains in this hilly region. Commissioning of this section covering 1117 RKM will electrify the whole southern territory. With the commissioning of above electric traction two parallel routes will be available between Lucknow to Mugalsarai via Faizabad- Ayodhya and via Raebarelli-Pratpgarh. After completion of this section an alternate route will be available between Jammu Tawi and Ahmedabad/Mumbai on electric traction. In RE, Semaphore Signals are required to be replaced by MACLS and mechanical interlocking by Panel Interlocking (PI) and Electronic Interlocking (EI) to make the system immune to Railway Electrification. In many places where MACLS signaling is already existing, the modification are carried out to ward off the unsafe effect of traction return current and induction from 25 kv traction system. The modification such as replacement of existing Line relays, Track relays, Block Instruments etc by AC immunized relays and Block instrument suitable to work in RE area, provision of single rail track circuits etc. are undertaken. In regards to communication system, additional circuits of Traction Power Control (TPC), Supervisory Control and Data acquisition System (SCADA) are provided at each station, SP, SSP and TSS location. The overhead communication is replaced by 6 Quad cables. · In Rohtak-Bhatinda section 05 stations have been provided Panel Interlocking. · In Meerut- Saharanpur section 08 stations have been provided with Electronic Interlocking. · In Gondia- Ballarshah section 13 stations have been provided with Electronic Interlocking. · 282no. IPS of latest specification has been commissioned so far at various stations & LC gates. · Networked Data Logger systems have been provided for real time recording & monitoring of all events of signaling equipments for preventive & predictive maintenance of signaling gears. Wherever overhead communication exists, induction voltage is produced due parallelism with 25 kv AC which makes circuit noisy on copper cable and unsafe for the staff. Further with the introduction of RE, there is need or additional control circuit such as TPC, TLC, SCADA, etc. To facilitate the above, existing overhead lines are replaced by provision of OFC and 6 Quad cables. In many places, wherever OFC and 6 Quad cables exist, they are checked for their reliability and identification of higher Earth resistance, low insulation etc. is done and are suitably replaced / attended to ensure interruption free reliable communication. Old non – jelly filled 4 Quad cable are replaced by new 6 Quad cables to improve reliability. SDH and Ethernet OFC equipment are provided for augmenting the channel capacity to provide additional circuit by integrating these equipments with Network Monitoring System. Latest Electronic Digital Exchanges have been provided at RE offices and Sub- divisional HQ offices for vital communication amongst senior supervisors with HQs and stations. For administrative communication and monitoring of progress of various projects, CUG mobile facility has been extended to all officers and supervisors. In addition to this, video conferencing between Secunderabad, Chennai, Bhubaneswar, New Jalpaigudi projets with CORE have been provided. Audio conferencing facility has also been established by CORE with all project units.